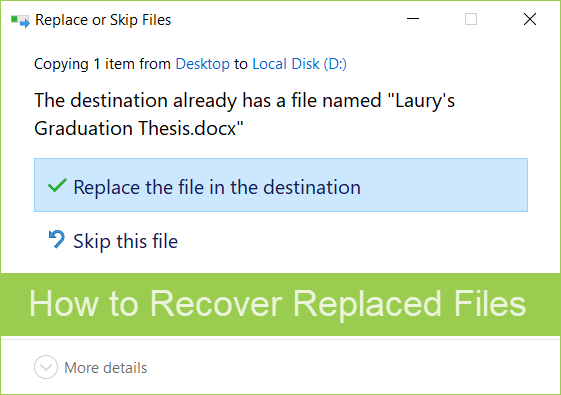 If you have replaced an existing excel or word document with a new but identically-named file in your computer, you might find the replaced original file is not in Recycle Bin, thus impossible to restore even if it is possible to recover files from Recycle bin after empty. Is there any way to retrieve replaced and possibly overwritten files? Don’t worry. In this tutorial, we will introduce 3 easy and useful methods to recover overwritten files that were replaced. If you are looking for a way to recover replaced files from your Windows 10/8/7, then Previous version is the first thing you should check. Previous versions come from File history and Restore Point. You may not be aware of their existence, but they are very useful. By using Previous version, you will be able to recover overwritten files, accidentally deleted or formatted files, or files you think are damaged in some way and you want them to get back in their original form. Step 1. Navigate to the folder where the original file was stored. Step 2. Right-click on the blank area, then choose Properties. Step 3. Go to Previous Versions tab. Step 3. Select the latest version from there and click on Copy. Step 4. Click on Restore and recover replaced files or deleted files. If there is no available previous version for restoring, then you can jump to Method 3 to recover replaced files without backup. Surely, you can turn on File history and Windows backup on your computer in case you need to restore overwritten files in the future. Similarly, Mac users have a handier tool for the recovery of overwritten files. However, there’s also a prerequisite: the Time Machine feature must be active. If it is turned on, then you can navigate to the folder that originally contains the overwritten file, and select a previous version of the file from Time Machine. If there is no option for restoring, then the last resort is Method 3, which does not require any backup and works on both Windows and Mac. If you have tried everything above but still unable to recover overwritten files or the files that you have deleted by accident or formatted files or files which are corrupted by some kind of virus attack. Then, rest assured as iReparo for PC will be able to get everything done as you desired. iReparo for PC is your best choice for recovering accidentally replaced files when you don’t have any backup. It is able to recover lost photos, videos, documents, compressed files and more data from Windows & Mac hard disk, external hard drive, memory card, USB flash stick and other removable disks. iReparo for PC is very efficient and easy to use, you can recover replaced files with it by following these easy steps. Step 1. Free download and install iReparo for PC to your computer. Step 2. Run the data recovery software, then choose Recover File. Step 3. Select the partition which the file was replaced from, then click Scan Now. Step 4. Preview found files, then select the data you need and click Recover button. 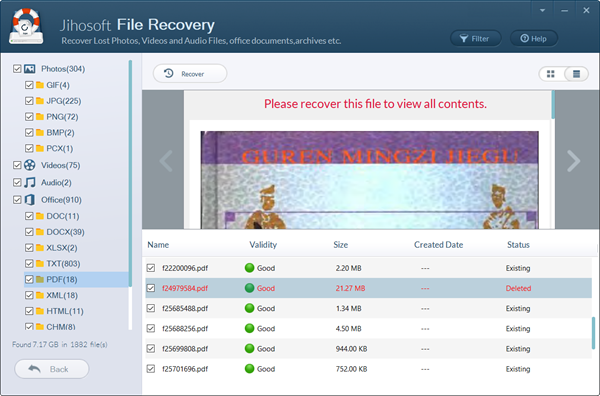 After the recovery, you will be able to access the recover files. It is suggested that you should save the useful files to somewhere safe as soon as possible. Though this file recovery software is very powerful, it is necessary to back up important data regularly. Besides these data backup methods, please kindly share with us other methods you know.